This is my new favorite project! A totally cute flip-card that can also be used as a mini album. The center section has a mat to add a gift card to, so this is great for any gift-giving occasion...birthdays, Mothers' Day, Graduation, etc. So many uses! The center section has a mat that is the perfect size to accent a gift card. Want the full-color handout with more photos, cutting sizes, and instructions? It's only $5.00 by clicking the "Buy Now" link below. 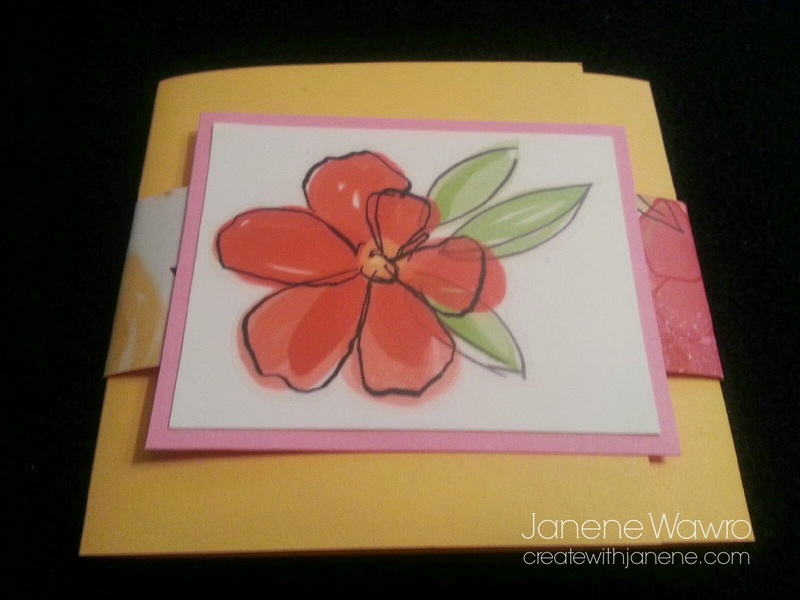 Simply place a minimum $10 order on my website at www.janene.ctmh.com and the instructions are FREE! (I'd recommend buying the "Brushed" paper packet and matching Complements - links at the bottom of the email), as that's all you need to create this, besides adhesive and a paper trimmer with a cutting and scoring blade. After placing your order, just email me and let me know that you'd like the Flip Card/Mini Album instructions. 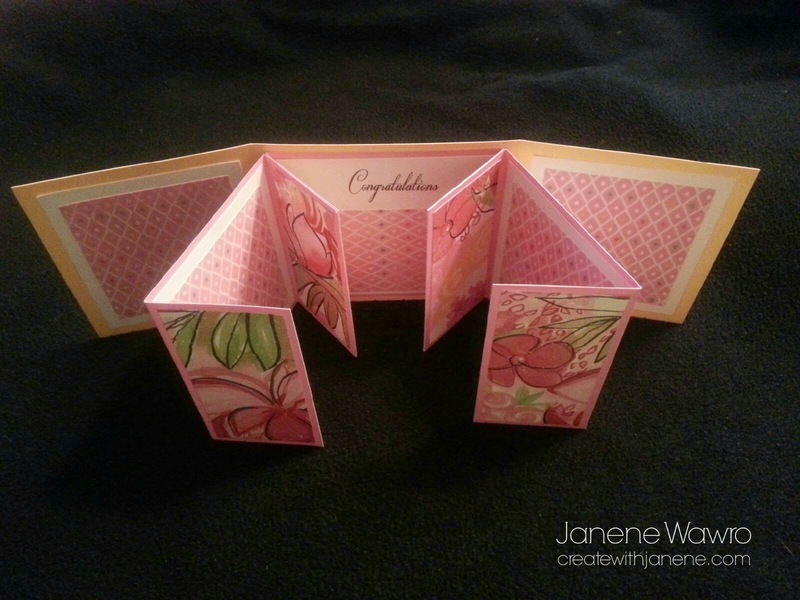 This is the closed flip-card, with a cute wrap-around paper closure. 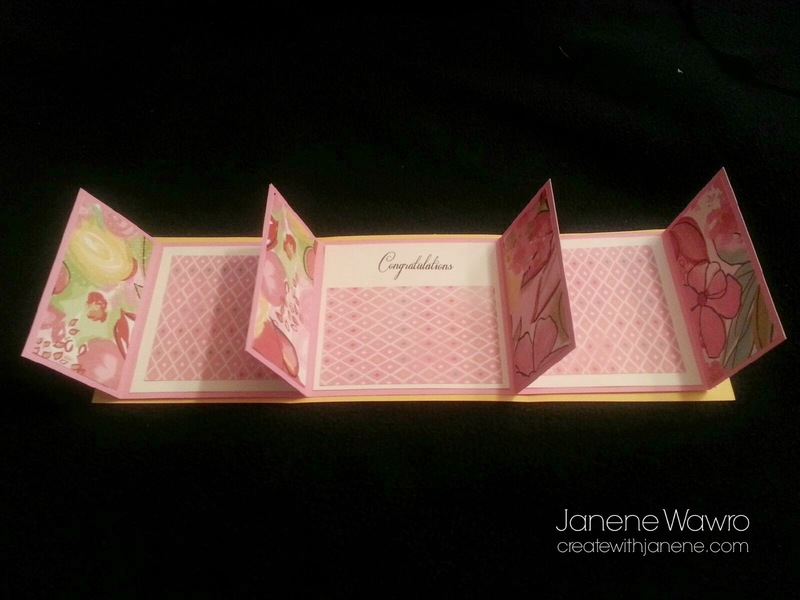 Slide off the closure and you'll be able to unfold the flip card to see many mini pages. My favorite? The center section! I created the pink mat below the stamped sentiment slightly larger than gift card size, so it's a perfect place to attach a gift card for the recipient! Look at the additional layers in this card! So many fun places that flip and fold out to reveal more thoughts and journaling, photos, or anything you'd like. I recommend using only flat embellishments so that it closes nicely and lays flat. Be sure to use a strong adhesive, and don't be skimpy along the edges. 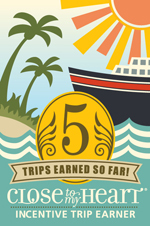 Don't forget to click the link above to get the full-color handout emailed to you in pdf version. Use the papers shown while they last, or substitute with whatever matching products you own. You can't go wrong with this cute project!